Your projects. Your project management style. You like the Context based approach of Getting Things Done (GTD® by David Allen)? Great - we like it, too! Prefer a more Agile approach or Kanban? No problem. Mind Maps and Visual Planning? Just map it out. PMBOK® and Work Breakdown Structures? We've got you covered. And the best of all: you don't need to decide upfront! It's all built around a core database - so you can switch back and forth between different styles any time. All this is jibber jabber for you? Have a look at the rest of this page to learn more about these concepts, when to use them and how they help you to get results. Getting Things Done (GTD®) is a time management method by David Allen: Collect all the material ("stuff") in the Inbox and later clarify and organize it. Some of it can be completed immediately, others should be reviewed later or is needed in a specific context (situation or location). 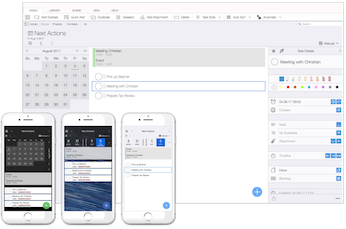 All our products support the basic concepts for GTD®: Collect stuff in the Inbox, assign (one or more) Contexts and set review dates. The integrated "Next Actions" view displays all items by review date side by side with your calendar entries. Context views show everything needed in specific situations or locations. If you have outgrown your simple task list and need a hands-on approach that really helps you to get organized, we recommend you read the book by David Allen - it is easy to read and especially useful if you are new to project management. If you don't have time for it you can always look up some summaries or get a short intro on Wikipedia. In Kanban, you organize your work on a Kanban board with multiple swimlanes (columns). Each column is a state (like "in progress", "testing", "released"), which every task passes through – from left to right. 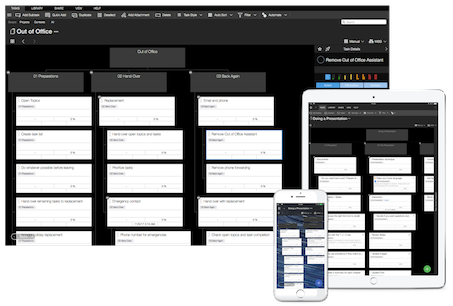 All our products can display every project as task list (tree) or Kanban board. There is only one predefined swimlane ("Backlog") that contains all tasks not assigned to other swimlanes. You can create any number of columns (swimlanes) that suit your needs and move tasks by drag and drop between the swimlanes. Kanban is especially helpful if you need to complete predefined steps for each item in the process. We use it ourselves for bringing out new releases of our apps, as they always need to run through the same stages - from "getting feature ready" to "in testing" to "updating AppStore descriptions" till the app is "in release". Get Visual with Diagrams and Mind Maps. Mind Maps are diagrams to visually organize any kind of information. The hierarchy in the diagram shows how pieces relate to each other. The idea to use diagrams to visually map information was popularized by Tony Buzan. 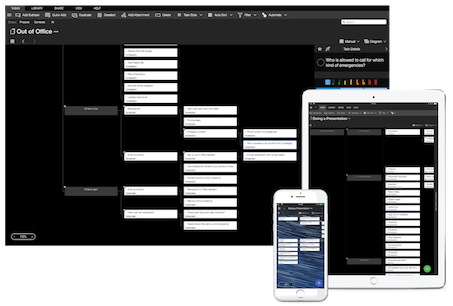 Taskfabric and Organize:Pro can switch between viewing task lists and diagrams/maps of your task for every project. Use drag and drop to re-arrange your task tree or add/edit tasks directly in the diagram. Some people are more visually oriented and can more easily draft up all necessary steps for a project with a visual map than a list. Just try it out for yourself to find your own preferences. If you are switching from a "MindMap only" tool, you can import MindManager™ .mmap and FreeMind .mm files. Diagram / Mind Map view is most useful when then number of tasks in a project grow. The visual view gives you a much better overview than just looking at a long list. Get Professional with Work Breakdown Structures. Work Breakdown Structures (WBS) visually display the work that is needed to complete a project. They are based on the Project Management Body of Knowledge (PMBOK®) definitions as published by the Project Management Institute (PMI). In a WBS you describe deliverables for each step of your project. This means you are describing the end product (like "documentation") not the process (like "write documentation"). You can then break this down into more detailed steps (like "introduction", "chapter 1", etc) and assign an estimated time for each step or assign steps using the RACI matrix to other team members. WBS will help you most as your projects get bigger and you want to get some time and effort estimates upfront. WBS divides projects into smaller, more manageable chunks that can be controlled better. Track your progress with Dashboards and KPIs. Key Performance Indicators (KPIs) are used to measure progress or in a broader sense to measure how effectively you are reaching your goals. Dashboards help you to group and visualize the most important KPIs and information (like most urgent tasks) in one place to get a quick overview. 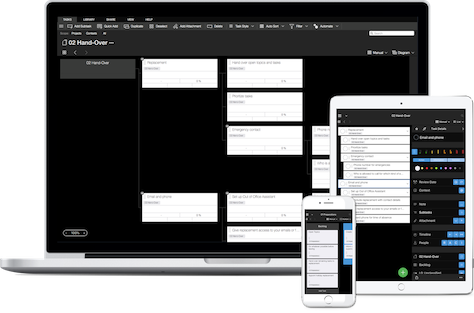 Taskfabric and Organize:Pro support multiple types of Dashboard panels. You can add KPIs that measure the number of open and completed tasks (i.e. daily for the last week or weekly for the last months), special lists (like tasks in Inbox or tasks for review today) or your most important projects. Start with a basic setup of Daily and Weekly progress (to show the completed tasks), overdue tasks and tasks scheduled for review today. This will give you an instant overview of how you did (to push your motivation) and what is to be done today. 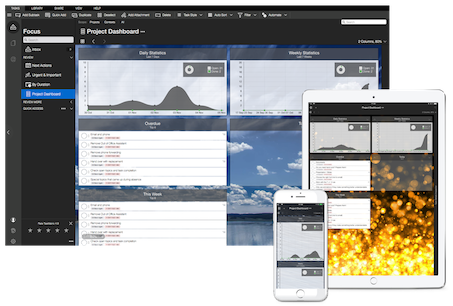 As the number of projects increases, add only the most important projects to the dashboard. 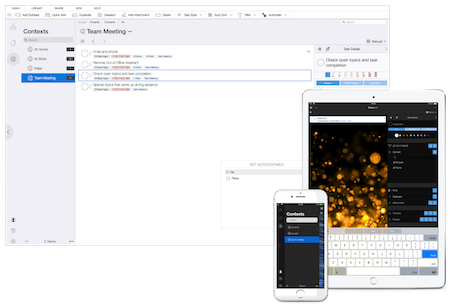 Cloud integrated: Work together and sync between devices. 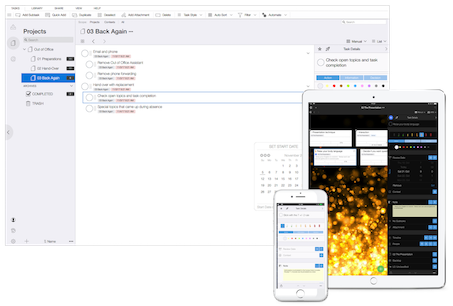 Taskfabric Cloud4 keeps your tasks in sync between different devices and allows you to share your projects with others. Use the integrated access control to allow them full access or read only access to your projects. Sign up from any of our products for free and sync between different devices and editions instantly. Sync is included with your license. This means there is not extra fee or subscription you need to buy. After signing up to Taskfabric Cloud 4 you can send new tasks to yourself by email (just send or forward any email to your personal @taskfabric.net email account that is assigned to each Taskfabric Cloud4 account). To share your projects invite others by email and select if they get access as Team Member (read only) or Project Manager (read and write). All people with write access can add comments to existing tasks, create or complete tasks. The Activity view quickly shows you what happened for everything and the Task Details Inspector shows a history of comments for each task. Apart from the obvious - sync and share - you get a free backup of all your tasks. 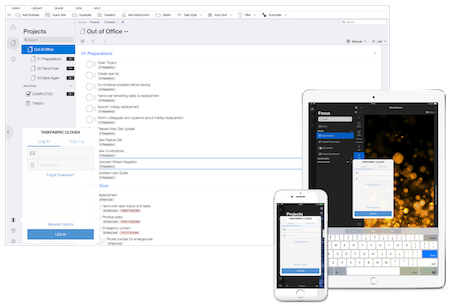 Any new device can re-sync all existing tasks from Taskfabric Cloud 4. If you lose a device you get up and running again in no time. But don't worry - Taskfabric Cloud 4 is no must. This allows you to work without network connection (i.e. on a plane). Speed it up with Templates and repeating tasks. Not every project does something new. Sometimes it's just the same thing over and over again. Templates will help you with these. Additionally, they give you a good starting point for new projects by using the integrated templates. Save any of your projects including all tasks to a file. This file can be used to create new projects with the Template Manager or you can distribute it to friends or colleagues, so they can use the template as well. Templates for common stuff - like onboarding a new colleague or moving to a new flat - are already included. Additionally, all our products support repeating tasks. This is like with your calendar where you want the same task to show up every Tuesday. Templates can be used if have to repeat the same tasks over and over again. 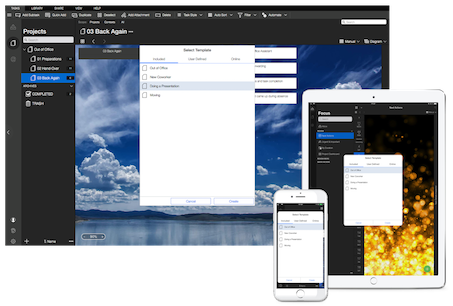 As an example, we use it for building new releases of our app. The same 150 odd steps are repeated for each release to make it available on all supported platforms. The Task Details Inspector allows you to specify a wide range of options and add additional notes or files to every task. This helps you to give large projects a better structure and helps you to focus on the stuff that really matters. Use the Task Details Inspector to specify a wide range of additional information for your tasks, add comments or see the task history (progress and comments by you and others - if the task is part of a shared project). Task classification (Priority, AID, Urgent/Important), additional information (notes and file attachments), setting dates (review, start and due date), duration and contexts. Give your tasks Context and Control Delegation with RACI. Contexts are the situations in which you need a specific task. This could be a location, an event or related to people. 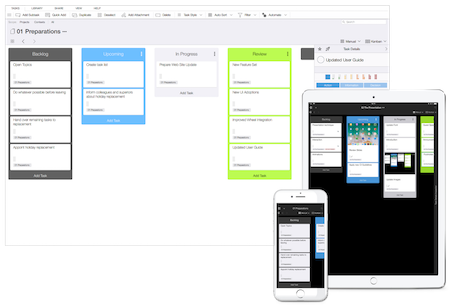 The basic idea is called "Context" in GTD® or "tag" or "label" with other task management methods. Assign as many Contexts as you need to a task. This can be the location where you need to be to complete the task (i.e. Supermarket if you need to buy food) or an event (i.e. Staff Meeting) or a person. When you arrive at the location (event/person) retrieve all related tasks from the Context tab. This will show you all tasks with the context assigned - no matter which project they belong to. RACI let's you go a step further when working with a team. You can use your existing (or new) Contexts to assign who is Responsible or Accountable for a task, who will be Consulted before making decisions or who needs to be Informed about the progress. Use Contexts to label your tasks. This helps you to get more structure when the number of projects grows and to pick the right tasks based on your current location or who you are with.